GM aims to cut European production by up to 25%. MUNICH -- General Motors Co. has paid back a loan from Germany and slightly lowered its target for job cuts at struggling European unit Opel. Nick Reilly, Opel CEO, said on Tuesday that his plans now call for cutting 9,000 to 9,500 jobs at Opel and British sister brand Vauxhall. Earlier GM had said about 10,000 of its 50,000 European workforce would have to be cut as part of a restructuring of the loss-making division. GM aims to reduce its production across Europe by between 20 percent and 25 percent -- the equivalent of three plants -- as part of the 3.3 billion euros ($4.9 billion) plan. GM this month backtracked on plans to sell Opel to a consortium led by Canadian supplier Magna International Inc. -- a deal that involved government aid -- and is now turning again to European states for help to keep Opel in business. On Monday, Reilly said GM will inject funds into Opel's restructuring but added "that is quite difficult because we are also going through a restructuring of our U.S. operations and other parts of the world." Separately, German Chancellor Angela Merkel said in Berlin on Tuesday that GM had paid back to Germany the last of its 1.5 billion euro bridge loan that was loaned to keep Opel from collapsing when GM went into bankruptcy for a short time earlier this year. "I can tell you that the last funds for Opel have been paid back by General Motors," Merkel said. "I expect at least a thank you letter from General Motors in a few years." 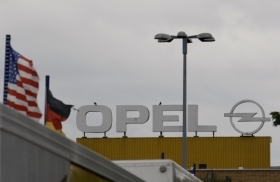 Merkel added: "German taxpayers have not lost a single cent on the entire Opel operation." GM will present its restructuring plan to Opel's labor leaders on Wednesday and to European governments by the end of the week. European officials will discuss possible aid on December 4. Reilly traveled to Brussels on Monday to meet EU officials and government ministers from European countries with Opel factories. The meeting was also attended by EU Competition Commissioner Neelie Kroes, whose blessing is needed before any state can give financial aid, as well as the bloc's industry commissioner, Guenter Verheugen. Verheugen said after the meeting that GM's plan could not work without state aid. "General Motors made one point very clear, 100 percent clear, the restructuring plan could only be achieved when European member states with Opel plants give some financial help," said Verheugen. "So the plan works only with state aid. The idea that General Motors can finance this on its own was not shared by General Motors, this possibility does unfortunately not exist," he said.